Going to a spinning meeting at Starnberger See in the afternoon to eating falafel, attending a WeBe3-concert and meeting friends in M.unich. Wore my First Spring-scarf for the first time ever. Ah, that purple bag is magnificent. But it looks heavy. Hope you thoroughly enjoyed your day. Love the purple bag, and also really liking the photos. De, the bag is both magnificent and heavy. It can be found here but I have to say that it a) tends to get very heavy because it’s so big you can pack everything, and b) I’m not sure but the strong magnets on the bag might be responsible for the two debit cards of mine that don’t work anymore. 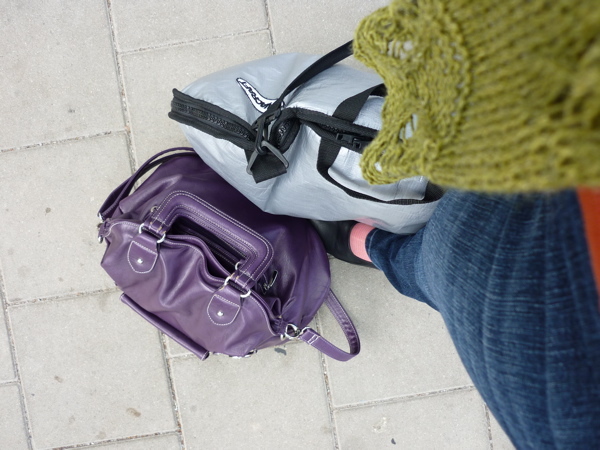 In that bag I had (apart from the stuff I always lug around): a book of sock patterns, a spindle and two ounces (about 65 grams) of fiber, my notebook, my camera, a two-pound bread for the meeting, a sock knitting project, and the pattern for the sock knitting project. In the weird looking bag that holds my spinning wheel there were about nine pounds of spinning wheel, two bobbins, an umbrella, and 150 grams (about 4 1/2 ounces) of hand-dyed alpaca. And I had a really great day. Jo, I’m glad you like the pictures. I’m enjoying myself very much with these as well.